Since 1936, this award has been one of the most highly regarded and long-standing honors program in the nation. Who’s Who Among Students in American Universities and Colleges is a distinction given to college seniors who meet the requirements for the national award. Students must display academic excellence, co-curricular involvement, citizenship and leadership. The selection process began at the beginning of fall semester. 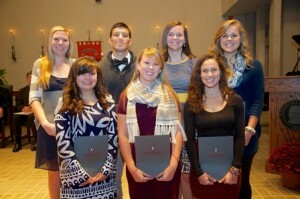 Students were nominated by members of the Newberry College community. Each nominee completed an application and a selection committee ranked the applications. The top 10 students were selected and endorsed by Newberry College and forwarded to the national office. The Rev. 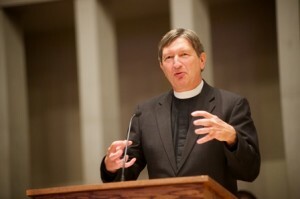 Dr. Mark A. Scott served as keynote speaker at the founders convocation. The former chair of the Newberry College Board of Trustees and vice president for Institutional Advancement, Scott described to students how the Lutheran faith has played an important role in higher education and how it played a pivotal role in his own family, including two daughters who had graduated from Newberry College. Inductees to “Who’s Who:” Summer Nicole Bartek, Theresa Nicole Bishop, Seiji Rae Borja, Holly Brisson, Rebecca Ann Eddy, Lauren Nicole Prachar, Maria Nicole Rivas, Lily Nicole Semones, Elayni Stokes, and Nicole Ann Teal.